THE Mt Hagen Rugby League has submitted its expression of interest to field a team in next year’s Papua New Guinea National Rugby League Competition — the Digicel Cup. The Hagen Kera Doa which will become the province second flag carrier after the Hagen Eagles. HRL executives comprising president John Ropa, deputy Willie Amos, secretary Joe Doshie and treasurer Chris Manape presented the expression of interest (EOI) bid to Joe Tokam, the PNGRFL Highlands confederate director last Thursday. Doshie said the league had submitted an EOI to the PNGNRL last season. He said they had simply revised their bid and resubmitted for consideration. The Hagen league was established in the 1960s and it is one of the pioneer leagues in the country. Ropra said the Western Highlands had always had representation in the semi-professional competition since its inception in 1990 but had missed out in the 2017 season due to the suspension of the Eagles franchise after violence-marred preliminary final at the Sir John Guise Stadium. Ropa said in 2004 when Sir Bob Sinclair headed the PNGNRL franchise owners were given more of a say in the running of the teams. He said while it allowed an open market for the best coaches and players to be sought by the clubs it also saw the control of the team and players shift to the people outside the rugby league fraternity. He said this had seen biased and misguided efforts to develop teams and be effective on the field. “The goal should be to give everyone a chance of taking part and exposing their talent,” Ropa said. 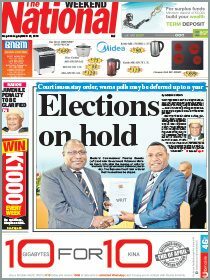 Ropa said he hoped their EOI reached PNGNRLC chairman Adrian Chow and that they would be given an opportunity to carry the flag for the province next year. Tokam commended Ropa and his executives for putting in an early bid.